I haven't had a Blenheim since the Nervous Center closed--the stuff is famously hard to find--so I was excited to see some brand-new stock at In Fine Spirits this weekend. It's going for the admittedly ludicrous price of $2 per 12-ounce bottle, but then again, this is a ludicrous beverage. 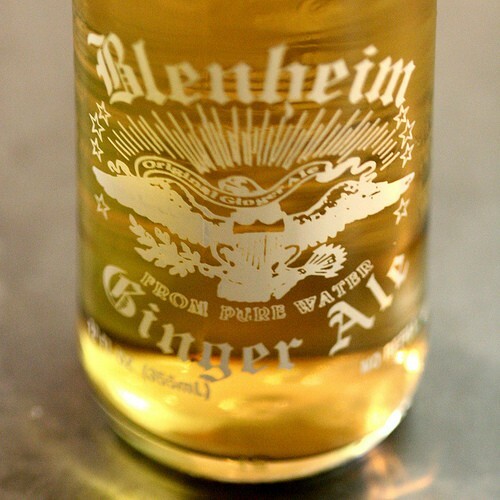 If, like I did, you grew up with Canada Dry--I remember thinking Vernor's was pretty spicy when I had it on a family trip to Ohio--Blenheim may be the first time you realize why ginger ale is called that. The hot variety--the one I've always bought--burns like chewing on the fresh root (OK, technically rhizome, no letters please) and leaves your lips and throat tingling for minutes after just one sip. Yes, the bubbles are going to make you cough. Don't fight it. This isn't some hippie crap from Reed's. It's medicine. The gentleman at In Fine Spirits told me there's only one remaining Illinois distributor for Blenheim, near the Wisconsin border, and apparently "distributor" is putting it kindly--you have to drive up there and pick the stuff up yourself. (I guess Wisconsin is closer than South Carolina, where Blenheim is made.) They've got a few cases now, but with gas so expensive they can't promise they'll keep making the trip for more.